Also serving communities of Mills River, Mills River, Fletcher, Columbus. There are 22 Assisted Living Facilities in the Hendersonville area, with 13 in Hendersonville and 9 nearby. To help you with your search, browse the 81 reviews below for assisted living facilities in Hendersonville. On average, consumers rate assisted living in Hendersonville 3.9 out of 5 stars. Better rated regions include Asheville with an average rating of 3.9 out of 5 stars. Caring.com has helped thousands of families find high-quality senior care. To speak with one of our Family Advisors about assisted living options and costs in Hendersonville, call (855) 863-8283. Twenty-five percent of the population in Hendersonville is aged 65 or older. As a result, seniors in the area will have no trouble finding age-appropriate activities, including educational classes, health and wellness activities and social events. Hendersonville is also home to 13 assisted living facilities, with another eight nearby. The state of North Carolina uses the term adult care home, or ACH, to describe assisted living facilities. The state's Division of Health Service Regulation licenses and oversees all ACHs, including those in Hendersonville. Seniors in Hendersonville will enjoy four seasons without any extreme temperatures. Average highs in the winter remain in the upper 40s to low 50s. During summer months, average highs reach the mid-80s. The area sees about 8 inches of snow every winter as well. Hendersonville's overall cost of living is comparable to the national average. While housing costs are just under the U.S. average, healthcare costs are about 10 percent higher than average. Seniors can ride the Apple Country Transit, a three-route bus system. In addition, the Elderly and Disabled Transportation Assistance Program (EDTAP) is available for in-need seniors to transport them to medical appointments or the grocery store. Seniors in Hendersonville can enjoy a variety of arts and cultural events organized by the Arts Council of Henderson County. Additionally, the Blue Ridge Center for Lifelong Learning allows seniors to enrich their lives through classes in several topics including wood sculpting, poetry and film. The Hendersonville area is home to world-class medical facilities, including Pardee Hospital, in the event of medical emergencies or illness. Hendersonville has an array of community resources for seniors, including the Council on Aging for Henderson County, an organization that offers community resources, health support services and meals for seniors as well as one senior center. Assisted Living costs in Hendersonville start around $0 per month on average, while the nationwide average cost of assisted living is $4,000 per month, according to the latest figures from Genworth’s Cost of Care Survey. 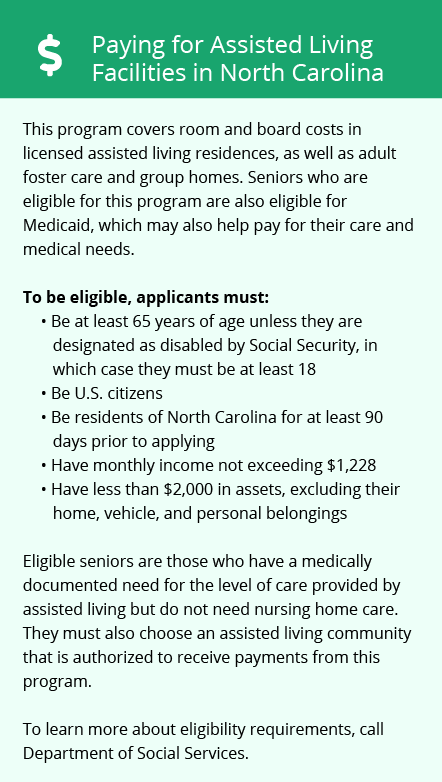 Eligible seniors in North Carolina can apply for financial assistance for their assisted living expenses. The state's Medicaid program includes coverage of adult care homes for Medicaid-eligible seniors who meet income requirements. Those seniors who qualify can receive funding to help them cover monthly assisted living costs. To see a list of free assisted living resources in Hendersonville, please visit our Assisted Living in North Carolina page. Hendersonville-area assisted living communities must adhere to the comprehensive set of state laws and regulations that all assisted living communities in North Carolina are required to follow. 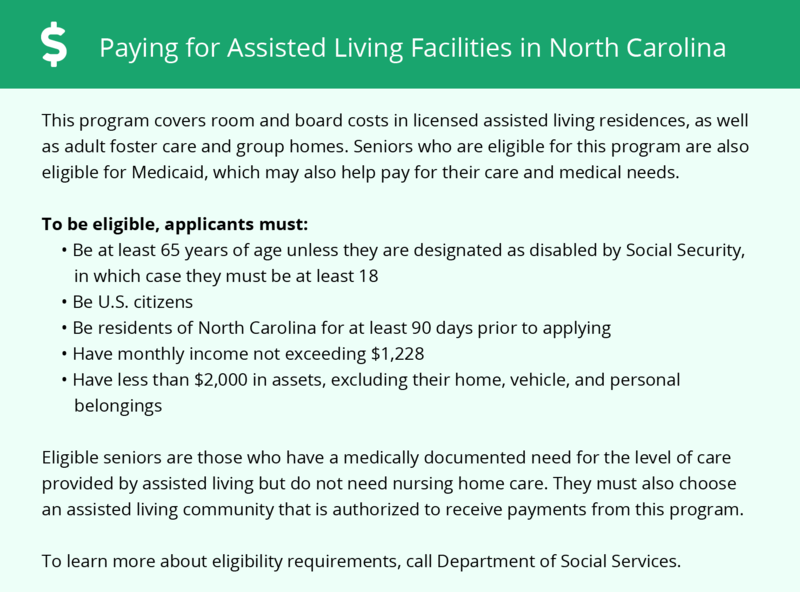 Visit our Assisted Living in North Carolina page for more information about these laws.